Within the pages of Danisha Deans new book, Love Letters From Ishra: The Power of Transparency, ($9.99, paperback, 9781498492676; $4.99, e-book, 9781498492669) readers will begin a challenge to live more transparent lives and find hope in Christ. As a licensed professional counselor, Deans shows how intimacy with Christ will lead to lives of restoration, courage, and love. Danisha Deans is an LPC in New Jersey with a private counseling practice, SUGAR Counseling, LLC. She holds a Bachelor’s of Arts in psychology and a master's degree in human service specializing in counseling studies. Her next work, titled You Are Worth It, will be published in 2018 and is a devotional awareness tool for men and women entering into marriage. Xulon Press, a division of Salem Media Group, is the world’s largest Christian self-publisher, with more than 12,000 titles published to date. 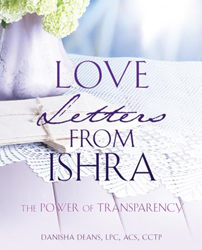 Retailers may order Love Letters From Ishra: The Power of Transparency through Ingram Book Company and/or Spring Arbor Book Distributors. The book is available online through xulonpress.com/bookstore, amazon.com, and barnesandnoble.com.